Not all the sites have updated in the last week but the trend for the most recent mocks is Miller. Davis is sliding a bit an James is becomming a player. The Mocks have tightened up once the underclassmen declared. 16 out of 21 picks were for the three above. I'm just not sold on James. Sorry! Have him rated as the 5th best DE in the draft, I think? I think many people are overlooking the fact that the Lions will probably lose McDougle in free agency. If that is the case, there is a strong argument to be made that the Lions will pick an offensive tackle at #10, likely to be Jamaal Brown. I don't know that the coaches are sold on Kelly Butler being the heir apparent, and Victor Rogers gets hurt too often and will likely not be re-signed. Please Lord God, Let not the lions choose another big nasty in the first round again!!!!!!!! 4) Heath Miller is looking better and better as time passes. 5) I want to trade down and grab Miller or Davis. But if TD doesn't work, give me my Heath! My question is, how can Heath Miller be looking better and better when he hasn't done anything since the end of the Cavaliers season? I believe that Alex Barron and Jamaal Brown are worth the tenth pick more so than Miller. Now, that being said, if Butler doesn't seem like he will be ready to step in as a starter this year, the Lions will likely make a mad dash to re-sign McDougle or set their sights on a free agent. I highly doubt they will want to leave the health of Harrington and Jones in the hands of a rookie lineman, or second year development project. I haven't said I want them to use the tenth pick on an offensive tackle, I would rather they trade down. I feel the Lions will be in a position to get some offers from teams interested in one of the top prospects that will likely fall. I am working on a chart to show what type of trade scenarios are likely for the Lions, using the Pick Value Chart, for each spot in the draft. What it will take for the Lions to trade up, and what it will net them if they trade down. No active players are taken into consideration as part of the trades, strictly 2005 and 2006 draft picks. Still working on my mock draft...........want to do three rounds to begin with. Anything more is foolish until the compensation picks are announced. 1. Offensive line - if they lose McDougle and/or Raiola and don't sign anybody in free agency. Jammal Brown and Alex Barron are the top choices. 2. Defensive Line - if there is somebody they really like that falls to them. Dan Cody, Travis Johnson, Erasmus James, Shaun Cody, Matt Roth, David Pollack could all be considered. 3. Heath Miller - Somebody who actually has good hands. 1. Thomas Davis - Considered to be a LB not a S at the NFL level. 2. WR, QB, CB, RB - too much invested in Rogers, Williams, Harrington, Bly, Bryant and Jones. 3. Derrick Johnson - Could be a very good player but the Lions already look set at OLB with Lehman, Bailey, Lewis, Davis and Curry. Whoops, didn't realizes that James missed some action this season. Makes his stats more respectable... maybe he will be moving up the draft boards... or maybe not. I don't know where you got the info from, but there are a small few teams in the NFL considering Thomas Davis as a linebacker. Most teams will be looking at him as a safety. He has the speed and size perfect for the position. He is a slightly slower version of Sean Taylor. The big difference is that Taylor played free safety exclusively at Miami, whereas Davis was bounced around from backer to safety during his years. Also, Davis was used as more of a 'rover' type safety. Georgia ran something similar to a 46 defense and used Davis closer to the line of scrimmage. Davis lacks the coverage skills of a Taylor, but things like that can be coached. I agree that some teams are looking at him as a linebacker, but that doesn't mean he won't get drafted as a safety ala Michael Boulware. The team that does draft Davis will have a good talent, but one that needs to be coached into his pro position, regardless of where they want him to play. I don't think Davis, Miller, E. James, S. Cody or Roth are worth the tenth overall pick. Detroit needs to trade down. From everything I've read the reason Davis is a canidate for LB because is he's good against the run but blows in coverage. Not a canidate for the 10th pick as far as I'm concerned. If your going to draft a safety that high he needs to be more versed in coverage. He's nothing like Sean Taylor I don't know where your getting that from. The Lions drafting Jammal Brown would be a sideways move. McDougle is a better player, and the Lions can address more important needs. McDougle is highly underrated by Lions fans IMO. I enjoy listening to the radio at a reasonable volume from nine to eleven. I don't believe Davis is worth the tenth pick either. I am saying he's like Sean Taylor physically, 6'3" and about 225 lbs. Davis isn't as fast as Taylor. I also explained in my post why Davis isn't good in coverage, it had to do with position switches and the manner in which the defense used him. 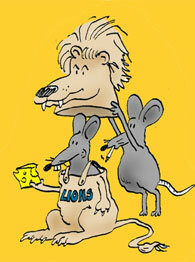 Lions fans have seen many years of McDougle. He is a good run blocker, but he's bad in pass protection. Jevon Kearse sacked Harrington three times when Detroit played Philly, and hand a handful of hurries on him. Everytime it was Jevon just going around or through McDougle. The man is a human turnstile in pass blocking. McDougle would be better used as a guard, and Brown may not be better than McDougle right now, but he will be. Brown is a better overall athlete and is in better shape. In addition, it's my understanding that Stockar wants to be paid like he's an All Pro. Color Stockar gone.